Don’t think officials who work in competitive cycling can relax when it’s cold. It’s hard enough to pick the winner in 40 mile-an-hour sprints decided by a tire’s width. But that’s nothing compared to the pressure of the end-of-year awards banquet. 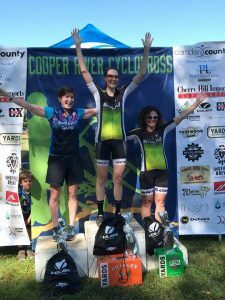 In 2018, one of the toughest jobs of those who run the Pennsylvania Cycling Association (PCA) was selecting the Women’s Masters Rider of the Year. There were so many ladies that raced — and raced well — on the road, track and cyclocross. That included 2016 PCA Masters Rider of the Year Masami Yamashita. She and Beth Williams finished one-two all season long in the state ‘cross series (PACX). They notched 7 wins between them in the W45+ category. Masami claimed the top spot with a win at the PACX final at Solstice CX. Things were even more complicated on the road. Seven women earned PA BAR points in 2018 in the W35+ category. But it’s important to note that many of those ladies race W3 or W1-2-3 races as well. That’s why we’re proud to share that in January, Team Skyline’s own Jennifer Rhodes was named PCA Masters Rider of the Year – Women! Shown here on the top step of the Cooper River Cyclocross, this young lady has been a fixture on the road for many years in Women’s Elite and Masters races. In 2018 she was 3rd at Iron Hill and Pottstown, 4th at Curt’s Cyclery and 5th at Cycledrome. She also earned BAR points in 4 W3 events. She has been very consistent in W35+ races since those events were integrated into the road calendar. 4th in the 2015 PA Road BAR and 3rd in the W3. One fan of Rhodes noted that her first result in the USA Cycling system was 13th in the Great Falls Criterium of 2006. Although it wasn’t possible to get a list of riders, there were 77 starters! Rhodes followed that impressive result by placing first at the Attleboro Bicycling Criterium in July 2007. Eleven years later, Rhodes is still getting it done on the roads, and off.